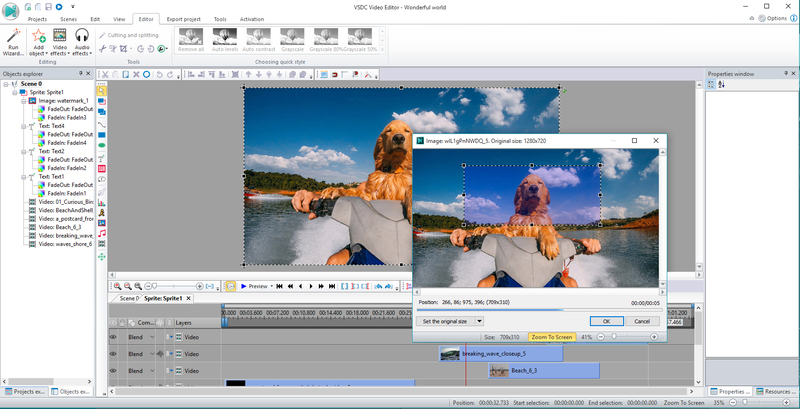 VSDC Free Video Editor is tailored for editing digital video and audio files in various formats including high-definition and ultra-high-definition resolutions, offering professional post production effects, as well as the ability to capture video from screen, record voice, burn discs, save multimedia files to a number of supported formats and publish them on OneDrive, Facebook, Vimeo, YouTube, and Flickr. A decent editor for all types of filmmakers. This is a very convenient program for those who are just starting to master the art of video processing. Pros: VSDC runs fast and has a pretty good toolkit (I'd say a surprisingly good for a free product). Bottom Line: A decent editor for all types of filmmakers. Pros: Very convenient that all formats and devices are supported for free. It runs really well, you don’t need to have the latest and the greatest system. Bottom Line: This is a very convenient program for those who are just starting to master the art of video processing.